Lock in a great price for Holiday Inn Express Hamilton – rated 9 by recent guests! We got early check in We asked for and got a room at the end of the hotel away from the night club a couple of doors up with a lovely view GREAT value Breakfast was included and was fine Beds very comfortable Staff REALLY friendly Free parking in retail car park adjacent to hotel. Loved the staff! Everyone was pleasent and helpful. Great location for everything we wanted to do. Breakfast was excellent offering a really good selection of items. Staff was very friendly. Excellent location, helpful and friendly staff. welcoming bar and lounge area with comfy seating. Good choice of breakfast to eat in the breakfast area, or grab & go if you are in a hurry. Good size rooms with everything you need in them including Iron & Ironing board. Conveniently right off freeway. Staff very friendly. Room clean, bed decent. Very helpful and friendly staff. Breakfast was buffet type allowing you to eat as much as you like. Holiday Inn Express Hamilton This rating is a reflection of how the property compares to the industry standard when it comes to price, facilities and services available. It's based on a self-evaluation by the property. Use this rating to help choose your stay! One of our top picks in Hamilton.Conveniently located just off Junction 6 of the M74, with easy access to Motherwell and Eurocentral, this hotel offers free Wi-Fi throughout and free parking in the adjacent car park. Hamilton’s shops, restaurants and multi-screen cinema are all a short walk away. 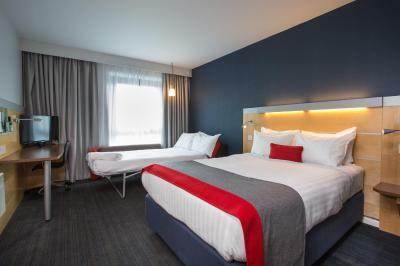 All rooms at Holiday Inn Express Hamilton are spacious and have private bathrooms, hairdryers and a comfortable seating area. Every room has a 32-inch flat-screen TV with Freeview channels. A buffet style breakfast is included for each guest. A tasty snack menu is available in the Great Room with soup, panini, pizza and curry, and the lounge bar has ample seating with a wide range of hot and cold beverages on offer. The hotel has a business center with meeting rooms with printing and photocopying services available. Located in Hamilton town center, Glasgow is just 15 minutes’ drive from the hotel, while Glasgow Airport is 25 minutes away by car. Edinburgh Airport is around 40 minutes’ drive away. Strathclyde Country Park is around 1 miles away. This property also has one of the top-rated locations in Hamilton! Guests are happier about it compared to other properties in the area. When would you like to stay at Holiday Inn Express Hamilton? A family room suitable for up to 2 adults and 2 children aged under 12 years. The room features a double bed and pull-out sofa bed, free WiFi, a 32-inch TV with Freeview and an private bathroom with power shower. A twin room suitable for up to 2 adults. This room features 2 single beds, free WiFi, a 32-inch TV with Freeview and an private bathroom with power shower. A wheelchair accessible room suitable for up to 2 adults. This spacious room has 2 single beds, wider doorways and adapted bathroom facilities. It also features free WiFi, a 32-inch TV with Freeview and an private bathroom with power shower. This spacious room has a double bed, wider doorways and adapted bathroom facilities. It also features free WiFi, a 32-inch TV with Freeview and an private bathroom with power shower. Thanks for checking us out, hopefully we can now convince you to check in! At the start of 2017 we refurbished all of our bedrooms - see the pics above - and we have also just improved the breakfast menu with additions like bacon, fruit compote and porridge, so some really great improvements all round. Yes, we're slightly biased but we cannot think of a better team or better location for you to stay in. Everyone in the team has been here for at least 6 months, (with a few of us here since we opened back in 2007 but don't worry we go home sometimes!) & we're all committed to delivering a great stay for you. In terms of location, yes the motorway is close but not too close, so you can easily get out and about, but we do have all the features and facilities of the town around about the hotel and within five minutes walk - be it restaurants, bars, parks, shops or free tourist attractions. We hope that we've assisted with your interest and hope to be able to welcome you in to the hotel really soon! And when you are coming here, there's free parking adjacent to the hotel, down to the right of the hotel as you look at the main picture. Mark & the team! House Rules Holiday Inn Express Hamilton takes special requests – add in the next step! Holiday Inn Express Hamilton accepts these cards and reserves the right to temporarily hold an amount prior to arrival. Guests who are unable to supply a credit or debit card as a payment guarantee on arrival are required to settle accommodations charges upon check-in for the entire stay in cash together with a cash deposit of GBP 20 and a valid photo ID. Free parking is available in the adjacent retail park. Guests must register their vehicle number at Reception upon arrival as the car park is patrolled. WiFi was working best in main hall but not so well in guestrooms. Friendly staff. Clean quite new hotel. Breakfast very good. Staff were extremely helpful, it was a pleasure to stay there. There was nothing to dislike, and I will use the Hotel again when I make a repeat journey. This was a stop-over on our way to the north-west of Scotland, purely to break the journey. Consequently, we were not looking at local attractions and facilities. The main positive point was the ease of finding the Hotal when coming off the motorway, and the ease with which it was possible to continue our journey. The check-in was quick, efficient, and friendly. No plates, cutlery or clean tables at breakfast. Not enough food to keep the options filled. Everything was fine as it was. No problems experienced. The staff on the desk were very helpful and explained everything we needed to know. The breakfast was extremely good. Breakfast was average. Staff was friendly. Good location. Clean hotel. Nice layout tea & coffee in the room bright and clean. Very accommodating towards myself & my 3 year old, really made us feel welcome. Lovely big shower with good water pressure. Bed was very spacious. Staff were all very friendly and attentive. The staff member did not alert me to register my car for the car park which could result in me receiving a fixed penalty notice. Easy to find. Staff super friendly attentive and helpful. Room really large and very clean and comfortable. Food and drink nice. Chilled out breakfast. Free wifi tio notch. Mattress was smaller than base and bed was uncomfortable. Kept rolling in the middle. Asked staff if mattress was supposed to be smaller and was told it was design of bed. Very clean, staff very friendly. Good location.